A series of dramatic stories revealed during the Sculpture exhibition, ‘The Pleasure of Influence’ by Tim Harrisson and Judith Frost, in the grounds of Deans Court. This production was again based on research undertaken by the theatre group – this time on the great plant collectors of the seventeenth century, especially Royal Gardener, John Tradescant, as well as contemporary attitudes to gardening. And on the cusp of the new millennium the theatre group felt Janus, god of beginnings and endings, needed reawakening to question the directions we might take. 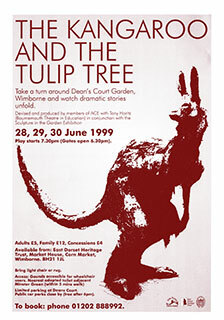 The production was created in partnership with East Dorset Heritage Trust. The following items from The Kangaroo and The Tulip Tree have been stored in our materials archive. Click here to view.